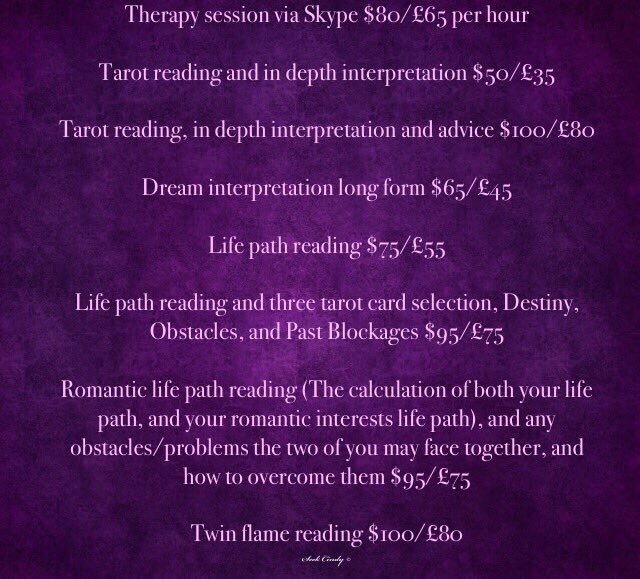 Twin Flame Weekly Reading – 30th January-5th February 2017; Dark nights of the soul that make us all whole. Greetings my love bugs – As I have mentioned on both my Instagram page, and my twitter, last week was a pretty emotionally, and energetically demanding week for me, and I did not find the chance to complete the general weekly, and the twin flame weekly then – HOWEVER, the cards were pulled, and I did find it very important to share the information that I found in them.. 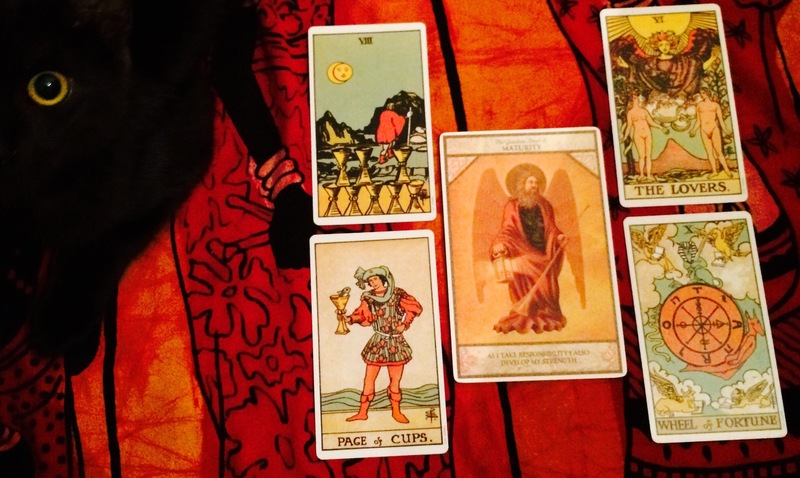 Although late, I believe this reading can still help many of us make sense of what was occurring for us last week. Please do enjoy, and understand a lot of these energies do tend to linger into the new week also.. The weekly for THIS week, will be posted shortly..Many thanks for your LOYAL readership! Main theme – 9 of swords, What is occurring for both twins – 3 of wands, Masculine – 5 of swords, 2 of swords, King of wands, Feminine – 4 of swords, The chariot, Six of swords. Numerological break down calculation – 30th – 3 (magnified by the presence of the 0) – Empathy, community, communication, creativity, birthing, merging, the divine mother – 5 – Change, transition, travel, newness, liberation, journeying. The 9 of swords demonstrates intense mental activity, and a sense of restless thought occurring for both twins this week. Perhaps it appears that things may have taken a turn for the worst, as our worst fears, and issues revolving abandonment and rejection are played out before our very eyes. The 9 of swords always represents the darkness in our subconscious mind – the nightmares, and anxieties that we have over what could go wrong in our lives. As 9 symbolises completion, likely, it is because both twins are aware that they have reached a time of immense change and conclusion in their lives, that they hold so many worries, doubts, and fears about what is to come. It may seem scary to make the leap from one state of being to another, but with the 3 of wands both twins are supported immensely to know that it is time to make the jump. A new life awaits the both of them, but yes it is both inevitable, and vital that they must face their own darkness, before they can introduce the necessary changes for salvation. There may be some hesitance to let go of what we thought we knew because of apprehension or anxiety about what this next stage may truly mean for us, but in order for us to manifest the visions that we have long conjured, there are definitely these vital changes that must be made. Holding on to the past only prolongs our pain, and suffering, and the 3 of wands hints that there are ships of opportunity waiting for us, to sail us to new lands, in search of what it is that we truly do want. The mind can often contradict itself – slipping between comfortability, and bravery. Both twins this week definitely seek new heights, and expansion, but they have also grown very comfortable with t he worlds that they know. A message returns to them. Perhaps they have prayed on something, asked for answers, or clarity, and it arrives to them this week – in the form of a dark night of the soul. Relax. Do not worry so much about what is to come – just know that it will come. There is a brimming excitement about the next stage in your journey that is ready, and willing to surface, but your challenge is to silence the mind enough to allow what is to unfold – to unfold. The mind can often play tricks on us especially if fear has had a large grip and influence on our existence. It is time to directly confront our fears. What are some of your fears? And how do they hold you back from love, from experiencing what it is that you truly desire? Both twins are asked to plunge into the depths of themselves, because dreams wait for no man. The 5 of swords describes an element of the masculine that I have discussed in previous readings. This is the part of himself that tries to protect, and to preserve himself by acting in a way that is typically in his own interest, and not at the interest of those involved with him. Perhaps he prefers to keep things to himself – he may have difficulty with expressing himself, or allowing himself to be vulnerable, so likely, he hides a part of himself, and in doing so this week, he finds himself in great trouble. The feminine may be expecting more from him at this time. Greater levels of communication, and reciprocity, but the 5 of swords can suggest that mentally, he is fighting a silent battle. He may be hiding something, with-holding information, or dealing with a situation less than in a manor that is head on. This is all about the ego self. The part of the self that compartmentalizes itself, after one has suffered much trauma, and deception in their lives. He may be wearing the suit of deception himself, and engaging in back and fourth displays with the feminine that leave her feeling tired, and worn out. Energetically, she may be feeling tired of going to war for her masculine – Reaching out to him only to have him turn her away, hide things from her so evidently, or fail to show up. 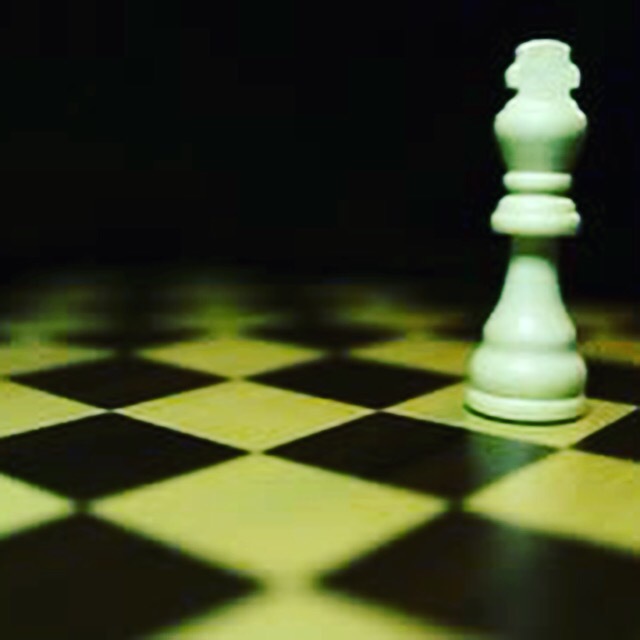 To him, this is something that allows him to maintain a part of his own identity, separate from her – careful not to get himself too entangled in her emotional web – but to her, this becomes just another game of attempting to prove her worth – through trying to get him to communicate directly, and confront matters in a straight, and narrow way. Perhaps it is vulnerability that he fears, so he gives only parts of himself, and parts of information away to others, always keeping a part for himself. He may have learnt to survive that way, and this week, the 5 of swords is teaching him that he can no longer carry on in this way.. Perhaps his deceitful ways may be catching up with him, and the 9 of swords represents his understandings, and peace making with the ills of his past. The 2 of swords represents for him the crossroads for change – should he choose to take that path. The 5 of swords, and the 2 of swords can sometimes describe a decision that must be made between 2 individuals. Perhaps in the 5 of swords there are 2 individuals who he is being secretive with, refusing to confess the entire truth. 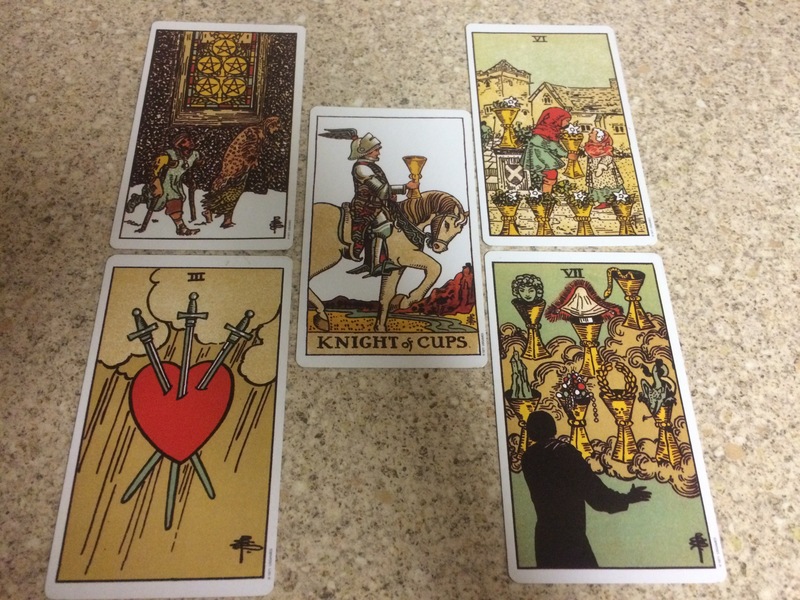 This could be why the individual presented in the card holds 3 swords – indicating that he is the cause, and the holder of the 3 of swords – which is the card that represents heart break, confusion, and disappointment. 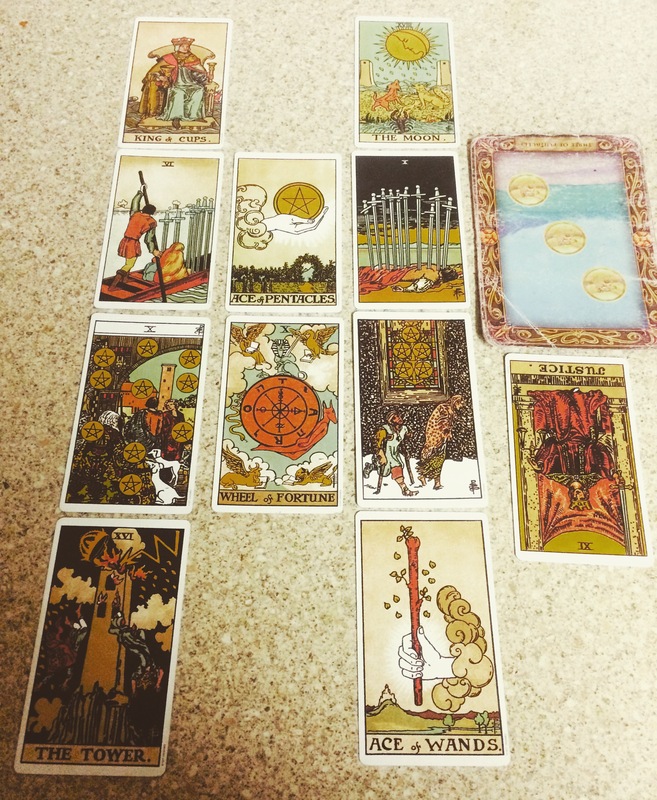 Perhaps this is what he causes for others when he behaves in these sneaky ways, whilst the 2 of swords that lay on the ground represent the decision that he is still refusing to make. His mind could potentially be split in to two, seeing the potentialities, and possibilies that could layf or him if he chose one of either path. Either way, a door way by the divine opens, and he must choose to step through one of the doors. He can no longer carry on in the same direction anymore, and his thoughts are intrusive to him at this time – urging him to take a closer look at his actions. Much mental activity, and thought could be creating stress for him, that only further causes him to push others away, as he experiences his own dark night of the soul. He may be attempting to avoid the situation entirely, but this does not mean that it does not creep up in his thoughts. This precipice that he sits on could be the difference between him receiving bountiful blessings, or still keeping in tune with the stagnant life that he has come to know. He may be needing to separate himself from a particular behaviour, mind set, belief, or person at this time, and time is ticking on for him to make a decision. The decision that he makes, will speak volumes about his desire, and determination for maturity. If indeed he can consider the needs of all those involved, and act in a way that is not only serving to himself. There could be the sense that any decision that he makes at this time may cause a great ripple effect, but still, he knows that he must move forward at this time. The 4 of swords in combination with the 6 of swords suggests that this is an immense period of healing for the feminine. Whatever the masculine is battling, or has going on over on his side, is directly impacting the feminine and the way she views herself. A dark night of the soul is triggered in order for her to retreat within herself, and find the peace of mind to make sense of things. The 9 of swords energy truly does take a hold on the feminine in this week, and she shows towards the beginning of the week a desire to rest, and replenish herself. She may be engaging in a lot of journal-ling, prayer, or spirit work this week as she turns to something within her in order to cope with this dark, and worrisome time. Perhaps she has not heard from the masculine, and she can feel his 5 of swords energy – that he is battling with a situation in his mind, and refuses to be completely open to her about it. For a long while, she has been very communicate with him, they both have problems with communication, but it appears that she seeks to take a break from being highly expressive, as she feels that he is not doing the same. The 4 of swords is a period after healing, when we try to gather our thoughts, and to find peace with what happened. 4 symbolises structure, order, and stability, so there is the idea present that she really wishes to find peace in her thoughts at this time, as she realises how they can wreak havoc on her emotions, when she does not monitor them, or remain present in them.. Both this week are dealing with the impact that childhood trauma, or experiences tends to have on our minds, the way we think, the way we communicate, and the way we treat others. The feminine wishes to heal from this painful situation, mostly by understanding why it took place in the first place, and accountability plays a huge role in the dynamics for both twins this week. With the chariot, and the 3 of wands energy, some feminines may be choosing to move on from the masculine, to create some space, or even to allow him the space to deal with his own inner battles, whilst she deals with hers. The 4 of swords could be her calling time out on the situation, maybe she withdraws because she realises that at this time, it is a battle that cannot be won. The masculine is split into two, battling his own demons, and it appears that she is exhausted from battling a life time of her own. The chariot energy is forward movement.. After she has received the information that she needs through the 4 of swords, she has a desire to charge on, this time with more responsibility, and control over her own life. The chariot pulls along to sphinxes, indicating the wildness inside of the feminine. Her inner beasts, as she attempts to steer her in life in the right direction by taking some responsibility over it. She may be coming to the realisation that for a long time she was not in the drivers seat – acting on impulse alone, and allowing her thoughts, life circumstances, and the thoughts, actions, and opinions of others to move her along life. Many awakenings and epiphanies that she collects during her period of rest, and isolation will be the inspiring jolt that she needs to move forward.. This distance that she creates is in attempts to find peace, and is not directly related with how she feels about the masculine – although he triggered this, her search at this time is actually much greater. As she attempts to seek peace of mind overall, and lay a lot of past issues, and wounds to rest. The 6 of swords places a large emphasis on family healing, and family wounds. She may be coming to the realisation that many of her thoughts, and experiences are in relation to habits, and beliefs that she picked up in childhood. The dark night of the soul and 9 of swords energy may very well point to the recognition of her shadow self being born of childhood wounds. It can be a very difficult time when we come to these realisations, and they do cause for us to be completely, and entirely honest with ourselves, but it is so necessary for change.. The feminine may be dealing with issues of safety, not feeling protected, or guarded, as the figures in the 6 of swords card are. Perhaps this relates to the feminine feeling unprotected by her father, lacking in masculine energy, or perhaps directionless, in relation to the men in her life.. She attempts to ignite her own masculine energy, with the chariot yielding both the yin, and yang in co-ordination to keep a steady pace that is direct, and certain of itself.. She may be seeking the aid, and counsel of others, trusted friends in order to comfort her at this time, or reassure her that these changes she is making, although difficult, are the right thing for her. There is a strong sense of community, so perhaps she is motivated to heal others because of the healing that she is working on within herself. The knight of wands at the end of the week shows that the masculine has a strong determination to fight the challenges presented to him within his mind. 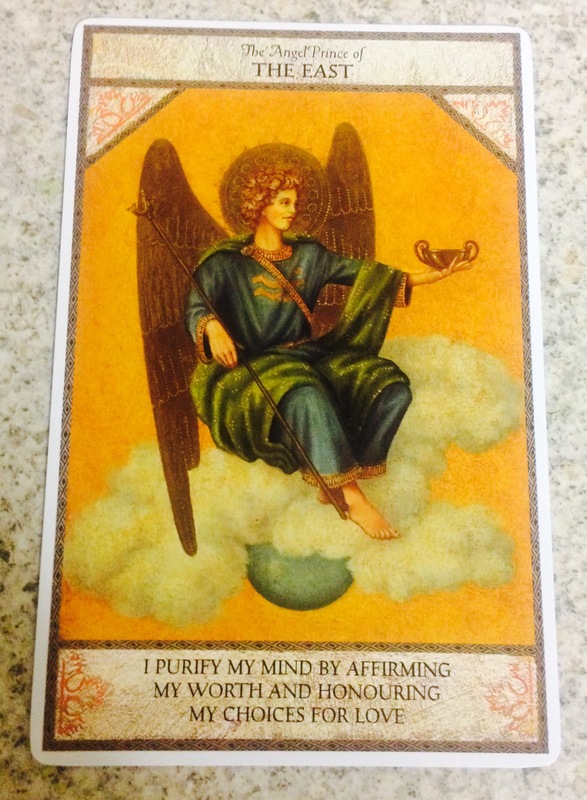 His spirit is strong, despite all of the weary battles, and there is illumination that is coming to him this week, about what he is to do, and his role as a provider – whether this be the provider of love, security, finance, or communication. There are certain roles that he must step into and take seriously as he reaches this stage of maturity. Perhaps he is cautious of hurting others by telling the full truth, or he cannot stand to let go of some crutches in his life, but the king of wands suggests some courage, conviction, and willpower that arises within him. Towards the end of the week, he is much more willing to take responsibility for things.. Perhaps this is because the feminine triggers him by seemingly moving away from him, or he feels energetically that she is checking out in order to tune into herself. The feminine may be growing tired of a situation that presents itself here, and rightly so, as she has been back, and fourth for a long time dealing with this seeming lack of inconsistency. The king of wands is gradual change on his behalf, perhaps he did not have the best father figure or remodel, and he is learning what it means to carry the divine masculine archetype, through the triggering that the two of one another provide each other with. Although this week appears very heavy, and intense in terms of self confrontation, everything is happening as it should to bring them both greater levels of awareness, and depth. They have healed a great deal on their journey, but there is always more understanding to be gained, and this week suggests a MAJOR push, and stepping stone in them confronting the truth of themselves, the best way that spirit knows how – Through a dark night of the soul. The king of wands is all about the illumination received when the masculine finally connects with his third eye, and allows communication to flow through him freely, and openly. A lot of the things that he has been blocking himself off from realising, come to him this week, and unblock his sacral chakra. This has a lot to do with his sexual energy, so his awakening can be tied into a sexual awakening in a sense. Perhaps he is gaining knowledge of the relevance, and importance of his own sexual energy – no longer seeking to abuse it, or to receive gratification in low vibrational ways.. This does not serve him, and as he matures actually, only depletes him if he does not recognise it as his life force. There is an empty pleasure in frivolous casual encounters that do not replenish his soul, and he is beginning to acknowledge this. The real worth is within him, and how he can express himself, and his feelings in colourful, and creative ways. I cannot say for certain that when he turns around and is ready to confess himself the feminine will decipher that she is fully healed, or even ready to embrace this next part of her journey with him, because her healing retreat, and mental healing does not seem as if it is something that she is taking lightly, or doing briskly this time. She recognises that it is a big effort, and there are multiple layers of herself that she must now get to know. He may think that he can awaken, click his fingers, and everything will return to normal.. But this may just be another time that both twins have to look unto themselves, in order to look into the frame of God.. Co-dependency, either way, will never make for a happy home. .
Posted on February 9, 2017 Categories empaths, Esoteric Knowledge, love, numerology, spirituality, Twin FlamesTags empath, fortuneteller, fortunetelling, numerology, soulmate, soulmates, spiritual, spirituality, tarot, tarotcards, tarotreader, tarotreadings, twinflamelove, twinflames, twinflameunionLeave a comment on Twin Flame Weekly Reading – 30th January-5th February 2017; Dark nights of the soul that make us all whole.